The Saturn S-Series (SW/SC/SL) was released into the wild in 1991 as the first vehicle to be launched by GM's Saturn Corp subsidiary. Saturn was marketed as "a different kind of car company" and its cars were designed mostly in house with little support from the rest of the GM family. Therefore, the S-series wasn't just another rebadged Chevy (think Buick, Pontiac, Oldsmobile, Cadillac...), and instead used a steel spaceframe with plastic body panels on what was called the GM Z-platform. 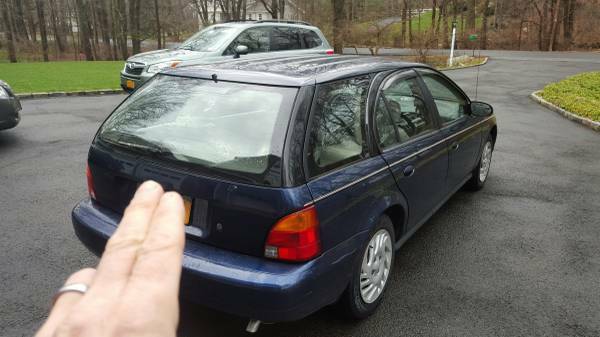 Find this 1999 Saturn SW2 Wagon here on craigslist offered for $1,500 in Cos Cob, CT. Tip from Cory. 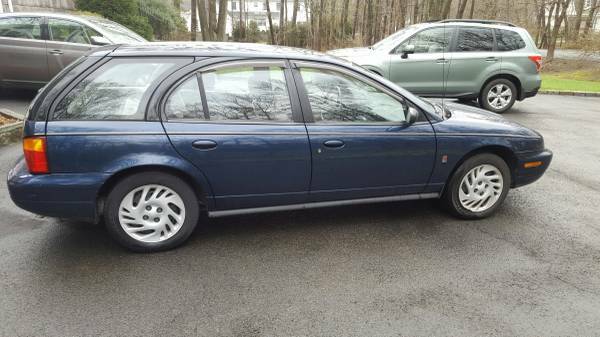 This 1999 SW2 comes from the second generation of Saturn S-Series production and is not only the desirable wagon version, but also features a 5-speed manual gearbox. Powering the little wagon is a 1.9 liter 4-cylinder DOHC engine that puts out 124 horsepower and 122 ft-lbs of torque. Don't go into Saturn wagon ownership expecting much and you might be pleasantly surprised. Seriously, I like small, 5-speed wagons, and this thing looks pretty clean. Mileage is getting up there, but I don't know if Saturns age well. Anyone have experience? Poor car must have the flu. First picture looks like it's going to sneeze, and the third picture looks like it's going to squirt. Friend had a Saturn, and all she would say was "worst car ever". I want to play the finger joke game. I guess the car likes one in the front and two in the rear? At 149K either the problems have been sorted or it will literally start falling apart on you as you drive down the road, ala James and Jeremy in the Lancia. Appealing, but not one interior pic? I have one of these sitting on my property that a buddy abandoned with (to?) me. It's an automatic and awful. Possibly the rattliest, creakiest, most soul suckingist car I've ever had the displeasure of being in. I had an early SW1 with an auto transmission. On wet days it would only work in 2nd gear! It was beat up, but the mileage was great. Not bad for a winter beater at $50 and a tune up. I think Saturns' (only?) saving grace was that RV'ers can flat tow the automatics without any transmission damage. Without using a drive-shaft dis-connect or an external fluid pump, this is pretty rare. What allowed for that? How did that work? I'm fascinated by people's abject laziness or complete inability to take a photo without a tag number - then using their fingers to obscure it. Even more puzzling as THERE'S NO JUSTIFIABLE REASON FOR DOING IT IN THE 1ST PLACE.